What a funny little movie. Typically British I would say. 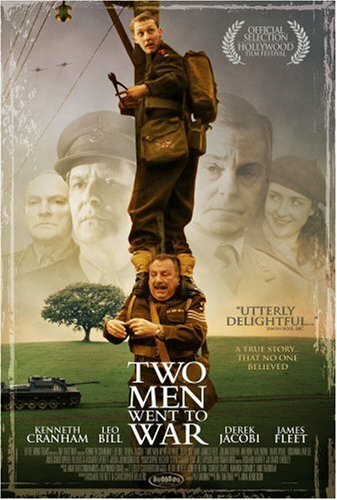 Two Men Went to War is apparently based on a true story although this is quite hard to believe. One can hardly imagine such naïve and idealistically enthusiastic men existed. Quite eccentric really. During WWII in Britain two army dentists who are fed up with looking after teeth while others take part in the action decide to take things into their own hands. The older, a dignified character, who has seen action in WWI, convinces the younger one to follow him and invade occupied France on their own. The general idea is to blow up some German ships in the harbor. While sneaking off they send a letter to Churchill informing him of their planned operation. Once in France they realize that things are not exactly as easy as planned. First there are no ships to blow up and second they seem a bit lost. So they need to come up with a back-up plan that includes cutting through electrical wires (just barely escaping their own extinction in the process), blowing up railway lines and a lot of other little sabotage acts. Many times they escape by sheer luck and after attempting to blow up a main Operations Room, which goes quite wrong as well, they are forced to flee and escape back home to England. On the way home by ship they are hit by a stray bomb, captured and promptly arrested for desertion. They are very lucky to avoid being court-martialled as Churchill sends someone to their help. He did indeed receive their letter and was cheered up a great deal by this picaresque little adventure. This is a tale of heroism of the comical kind, burlesque but very touching. It is quite a silly but all in all an entertaining, well acted little movie. By the way, Leo Bill, who stars as the younger dentist, plays Hamish in Alice in Wonderland. This entry was posted in Movie, Reviews, Trailer, War Movie, WWII and tagged Leo Bill, Movie Trailer, Movies, Reviews, True Story, Two Men Went to War, War Movies, WWII. Interesting post. I have a gut feeling I won’t like it, but I am willing to give it a try. It’s funny. You can’t take it too seriously although it is said to be a true story. Very British.